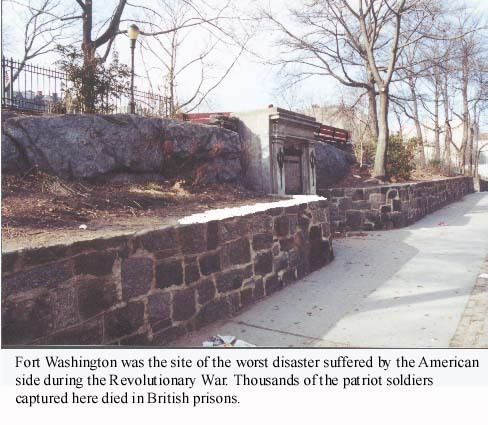 Fort Washington was supposed to be something of an American Gibraltar, a rock commending a narrow waterway that could be held by a small force against an overwhelming enemy assault. George Washington never felt very comfortable about the prospects for his namesake citadel on rocky slopes 230 feed above the Hudson River. 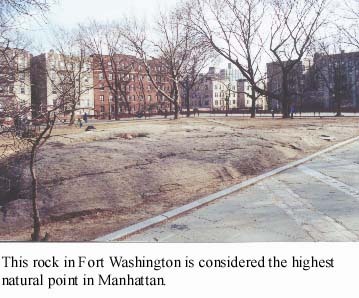 As the rest of Manhattan was taken over by the British, Was hington several times asked that the fort be evacuated. 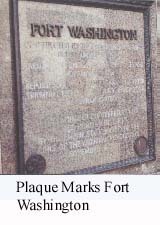 The commanders in the fort and Washington's subordinates always felt the fort could be held, and if not, the defenders could easily be evacuated across the Hudson River. Washington's misgivings were well founded. On Nov. 16, 1776, the British attacked with 8,000 troops against the American force of approximately 2,800. While the Americans were too few to hold the extensive outer works of the fort, they were too many to crowd into the central portion and fight effectively. Col. Robert Magaw surrendered. The Americans lost 53 killed, 96 wounded and 2,722 captured. Many of those who surrendered were to die in the British prison ships in the harbor. Margaret Cochran Corbin was wounded in action while helping to fire one of the fort's cannons after she took up the responsibilities of her wounded husband. 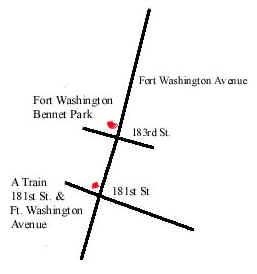 Transportation: Take the A Train to 181st Street, walk north on Fort Washington Avenue to 183rd Street.